Texas law graduates would no longer face the Texas bar exam, and instead take a test with fewer essay questions that could qualify them for a law license in 29 states, if the Texas Supreme Court accepts a recommendation from one of its task forces. 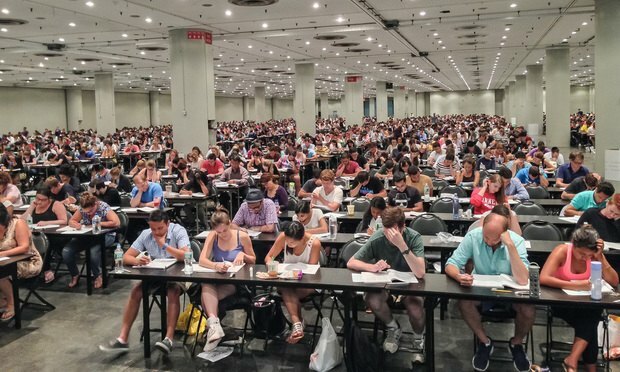 Students taking a simulated Multistate Bar Examination in 2014 at the Jacob J. Javits Convention Center in New York City. In this first installment of The Big Fail, a series focused on the high percentage of law graduates failing the bar and the impact on law schools and the legal profession, Law.com examines how far rates have dropped in recent years and the reasons for the decline.